Several years back I got the idea to use a globe of the Earth with attached Moon as a novelty pincushion and emery in place of the traditional tomato and strawberry. I talked to Sherralyn about the idea and she thought it might work but said that it was not obvious how to sew up a pincushion sized sphere. So I looked at some possible solutions. I considered a gore map. But Sherralyn didn’t like all the darts that approach implied. 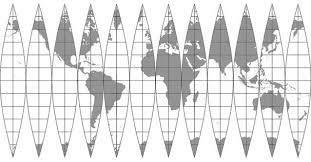 Finally we settled on the Waterman butterfly projection map as perhaps the easiest to sew up on a machine. 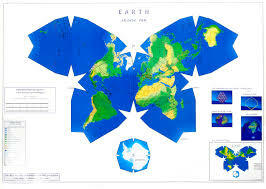 Its compact shape fit onto a 8½”x11” piece of paper better than the more elongated maps. As a sewing project, this approach has two single darts, four clusters of triple darts, and one main seam. I drew shapes based on the Cahill/Waterman octahedrons, added seam allowances, and marked the darts. 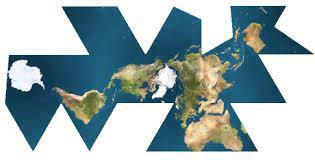 I made the shapes blue and manually placed images of land masses copied from a map where I thought they should go. Oh, and I added a patch with Antarctica on it. As the Moon is only about ¼ the size of the Earth, Sherralyn thought that a simpler approach was needed for the satellite. Photos of the two sides of the Moon were placed into yellow circles and a few darts were added. 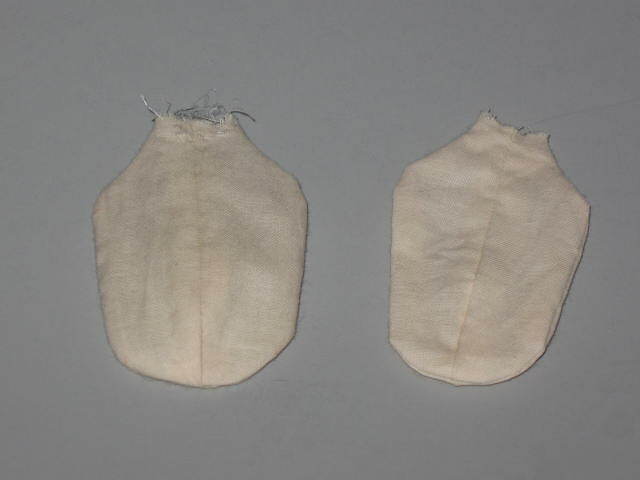 This allows the Moon to be sewn up like a small cushion. 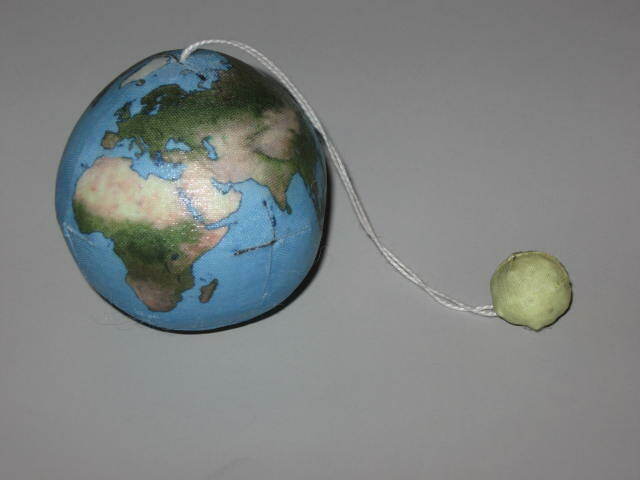 While the Earth and Moon are roughly to scale, the cotton pearl connecting the Earth pincushion to the Moon emery would need to be almost 7 feet long to keep to scale so you may want to compromise accurate scaling there with a more practical length. The original pattern was scaled for US letter size paper but would fit on A4 paper as well. When I uploaded it to Spoonflower I rearranged the components to fit an 8”x8” swatch but did not change the original shapes. I have written a first draft of instructions for making an eighteen inch (45 cm) Kitty doll. I like to sew a new doll while I am proof reading new instructions. 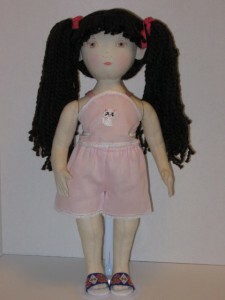 I made my new doll with brown hair. I used the wig instructions that I had already written, but I gave my new doll two ponytails at first to see if I could adapt the basic wig to different hair styles. Then I braided the yarn wig. Here she is wearing braids like my first Kitty doll. 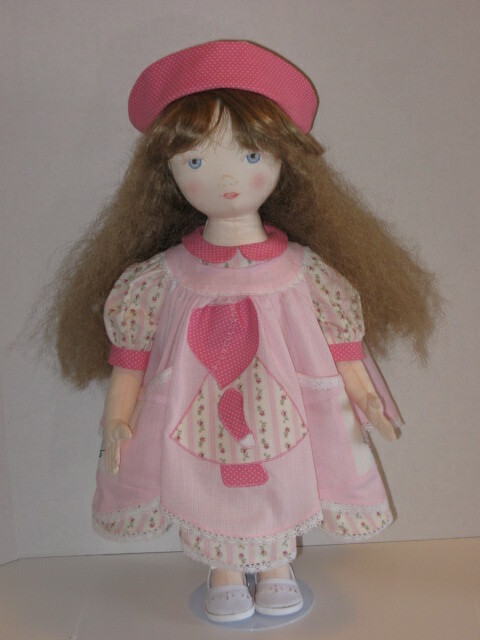 The dress and jacket were made from my new A-line dress pattern for eighteen inch dolls. Now I need to edit my new dress pattern. Here is the doll I showed you last week. This week she has a yarn wig. Today she is wearing the sundress from my book, Learn to Sew for your Doll. 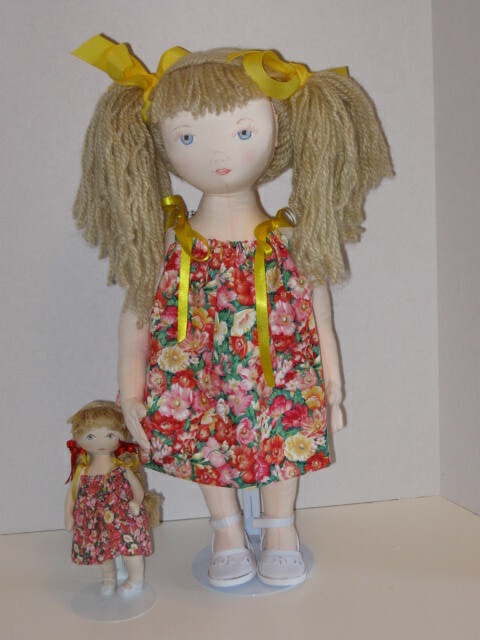 Seven and one half inch (19 cm) Florabunda is standing with her to show the eighteen inch (45 cm) doll’s larger size. I had to give my larger doll an ear transplant so that she could have a hair style that showed her ears. I had originally placed the ears too high on her head. I have redrafted the original pattern to show the new ear placement. The new draft also gives the doll shorter arms, a slimmer waist, and a shorter neck. I think that these slight changes will improve the doll’s appearance. In a week or two I will show you the doll constructed from the newly drafted pattern. I had a recent question from a reader about the feet/toes pattern that I was working on a month or so ago. 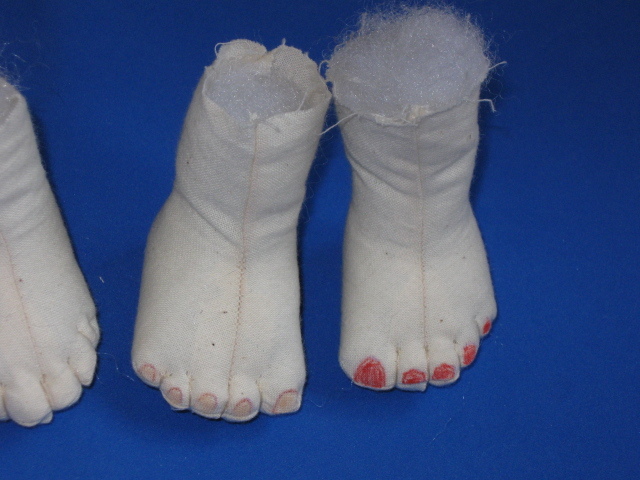 If you are interested in cloth doll toes, I explain how to change a cloth doll foot pattern to add toes in an article for Soft Dolls and Animals! The magazine will publish my article in the January edition. (I think that it will be out in November.) The article also includes a pattern to add toes to their signature doll, Siggy. 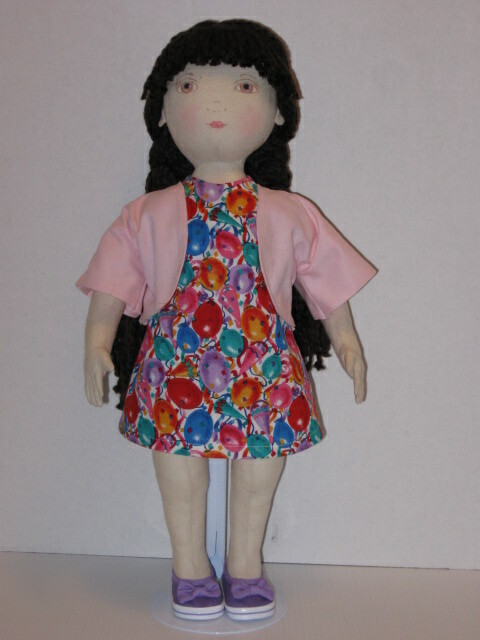 I am using my new toe method in the eighteen inch (45 cm) doll pattern that I am working on now. Here is a picture of my work in progress. The doll is wearing a purchased wig. I plan to give her a yarn wig before I start working on a new doll. The pattern will need a lot more tweaking before I can publish it. I put her ears too high on her head, poor thing. She also needs a shorter neck and a smaller waist. I am always surprised at how long it always takes to finish a doll pattern. Three weeks ago I showed you my efforts to add toes to a cloth doll foot and leg pattern. Today I have been experimenting with drawing toenails on soft sculptured doll toes. I have learned to use an air soluble pen when I draw anything on a cloth doll. When I am happy with the results I trace over the drawing with permanent ink, pencil, or paint. In this picture you can see my two tries for adding toenails. For the first foot I outlined the nails with air soluble pen. Then I went over those lines with a waterproof brown pen. I filled in the nails with light orange pencil. For the second foot I colored over the first lines with waterproof red pen and then used the same pen to fill in the nails. I am not completely satisfied, but I am making progress. My doll toes designs are taking longer than I had planned, but I am always surprised at how long doll designing takes. My small doll patterns have instructions for adding optional toes to the dolls’ feet. I had a lot of fun designing this detail. I found that it was easy to add toes to such small doll feet. I decided to try making toes on larger dolls. 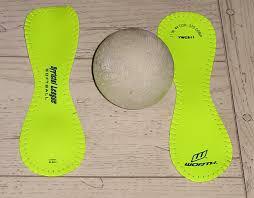 The left most foot was made from the original pattern. For the next few feet I tried free form sewing of the machine sewn toe seam and the soft sculpture hand-sewn toes. When I looked at the feet that I had made, I decided that I would need a template for the toes to get the result that I wanted. After a few more tries, I am happier with the toes. Now I need to learn how to add toenails. My current pattern project is a ball gown for young princesses. I am designing it to fit my three small dolls. It is made with a bodice that stops at the natural waist and a gathered skirt. With a shorter skirt and simpler decoration than the elaborate ornaments necessary for princesses, the pattern can make a classic little girl dress. Here is Florabunda in her princess dress. I am almost finished with Tender Heart and Twinkle’s dresses. I will show them to you next week. I hope to have the pattern completed in a few weeks. 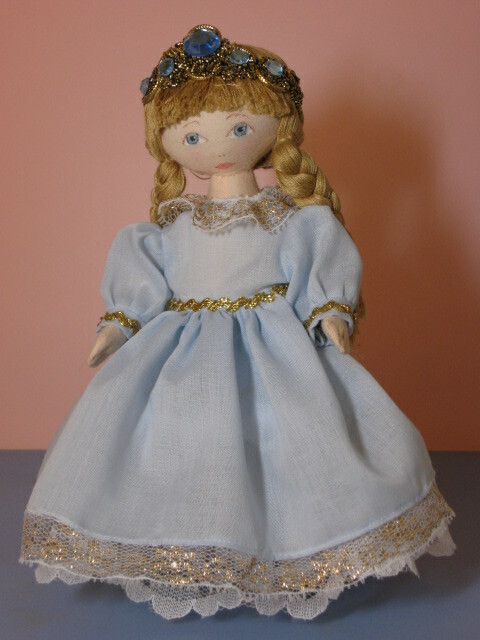 I have been working steadily on patterns for three small dolls. The dolls’ pictures show up occasionally in this blog. I felt satisfied with the patterns, but decided to make each of the dolls one more time to check the patterns’ accuracy. Friday night I discovered that my latest version of my smallest doll had a body that was much too large. I was afraid that something was wrong with the pattern. Saturday morning I got out my smallest scissors and my seam ripper. I removed the poor doll’s arms, legs, and head. Then I removed all the stuffing from the body. I then compared the body to the body pattern and was relieved to find that the body was larger than the pattern. I hate making mistakes, but I was glad that my mistake was a cutting error. The pattern I had been working on so long was correct. When I cut a new body I tried out a new rotary cutter that I purchased recently. It has a small blade and cut the tiny pattern pieces accurately. My new Twinkle now has a body transplant and is on her was to being a complete little doll. 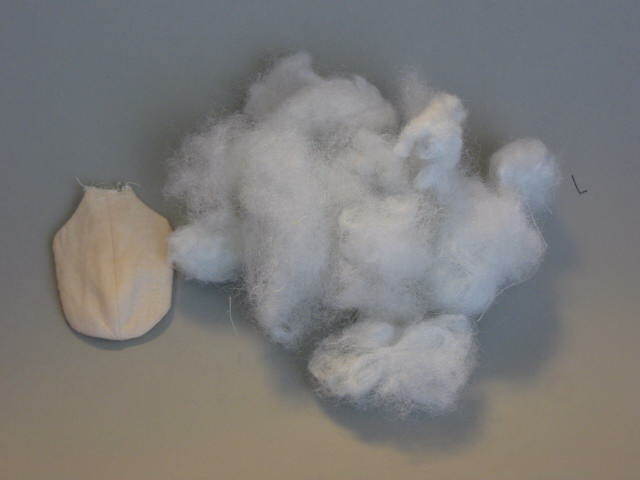 My sewing mistake gave me a chance to show how much stuffing it takes to make a firmly stuffed doll. I removed all of the fiberfill shown from the small doll body on the left. Though most of the stuffing expanded when it was removed from the body casing, some of it remained compressed. The doll body on the left is the body that I cut incorrectly. 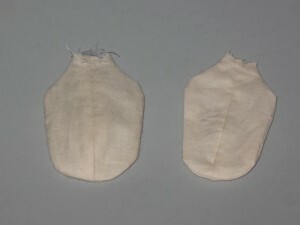 The smaller body was cut and sewn correctly. The small rotary cutter at the top of the picture did a good job cutting small doll patterns. 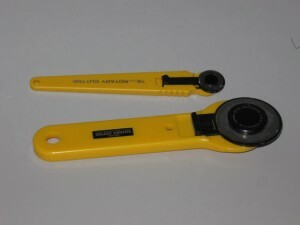 The larger cutter is for cutting long straight strips of fabric. This past week my husband and I finished the globe pin cushion project that was discussed in last week’s blog. We treated a piece of white cotton broadcloth with Bubble Jet Set 2000. This product is a liquid available on line. After the treated fabric had dried, we cut a sheet of freezer paper to the size of printer paper and ironed this sheet to our treated fabric. We trimmed our fabric and printed the globe pattern on it. The homemade fabric sheet worked fairly well, although we found that the printed colors faded more than the colors on the commercial printable sheets that were discussed last week. Anyone who is interested in making the globe pin cushion can download a copy from this website. Click on the pattern button at the top of the page and then on the pin cushion picture. The instructions are in inches rather than metric measurements. The files are made to be printed on US rather than metric printer paper. I hope that the pattern will be usable for anyone who is interested in it. If you have any questions, please email me or make a comment on the blog. My husband takes the photographs for my blog and downloads them for me. After he photographed my tomato pin cushion, he started thinking about making a globe pin cushion. This idea lead him into map research. 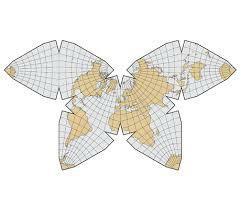 He came up with a globe pattern. I helped with suggestions on darts and seam allowances. We then did more experiments printing on fabric. We tried several commercial fabric sheets made to go through ink jet printers. Some of the commercial fabric sheets are treated to make the printer ink permanent. We also discovered a simpler way to make our own printable fabric sheets. We discovered a chemical used to make the ink permanent on homemade fabric sheets. We haven’t tried the chemical yet. I will let you know how it works for us. All of the products that we tried were made for the quilting industry. Quilting is a much more popular craft than dollmaking. If I had paid more attention to quilting news, I would have discovered these techniques earlier. The fabric on this globe had not been pretreated to retain the ink. It was painted with Mod Podge to protect it. The coating gives it a shiny finish. 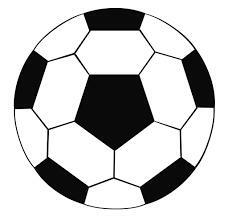 The moon is the correct scale size for the earth, but it should be attached with a seven foot string to be the correct scale distance. 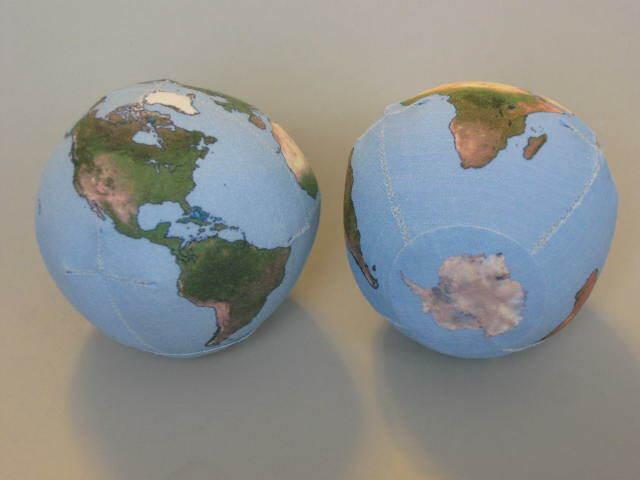 These globes were printed on June Taylor Sew-in Colorfast and Printed Treasures by Dritz. After the fabric was printed, it was rinsed and allowed to dry. Then I cut out and sewed the globes. Both of these products were made for quilting appliques. They were not designed for the type of sewing required for the pin cushion, but I was able to make a pin cushion from each of them. The June Taylor sheets were stiffer and harder to sew.